Well, new house, new extension! To recap, in my previous house I built a single storey rear extension for a new living room, turned old living room into a kitchen, and then 2 years later, I did a loft conversion. The extension was recorded daily on this blog, but the loft conversion was not – I decided to do one big write-up at the end, but never found the time! I decided to save money and do the drawings myself, and submit to planning myself. This took some time, but the cost to get planning permission was just £170. I used a free interior design program called Sweet Home 3D to create the plans. 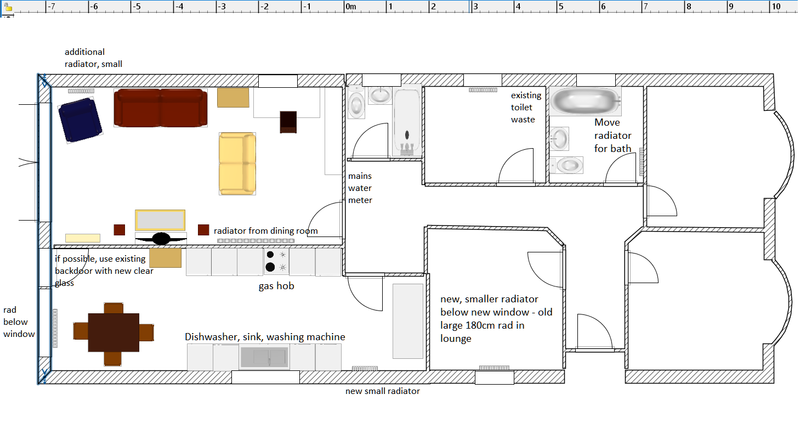 It’s very easy to use, and more importantly, to plan the layout and sizes of rooms. It has a handy background image upload feature, so I just uploaded the estate agent floor plan and draw my walls over the top. Doing the roof plan was trickier, but I managed it and the local council planners were happy with my efforts and gave it their stamp of approval. The existing rooms going clockwise from top right are: main bedroom, living room (with chimney), entrance hall, dining room (with chimney), kitchen, shower room (was a bathroom, now has long 170cm shower tray), bedroom, WC (made with thin stud wall, no wash basin), box room (where the treadmill currently lives, along with our flat packed furniture). The extension will turn the existing small 3 bedroom bungalow with small kitchen and one bathroom, (plus 1 tiny WC) into a 4 bedroom bungalow with a large kitchen-diner, large living room (both facing the garden), and 2 bathrooms. We decided not to bother with an en suite, 2 bathrooms should be plenty for us – after our 2 extensions in the last house we had 4 toilets, which meant too much cleaning to do! The kitchen will be about 9m long, but we will use the first 2m as entrance area and a space for the treadmill (no home gym in this house). The living room will include the computer desk, as there is also no office. The fourth bedroom will be the kids playroom (read, X-box room!) and guest room (sofa bed will fit perfectly). We’ll be removing 2 chimneys to create larger rooms too (the two existing bottom rooms have chimneys). The current lounge (bottom right room) will become the main bedroom, and the dining room (bottom middle) will become a bedroom. The old WC will be removed and a new corridor created through the middle of the house, to go into the living areas at the back. The box room will be a new bathroom. To save money further, I decided not to have building control plans (structural drawings) drawn up. In fact, a local designer / technicial, Nelson-Cole Design, advised me over the phone that for such a simple extension, the best way forward is to use roof trusses. The only complicated part of the build that requires calculations for building control to approve is the roof structure, and a truss company will provide the calcs with their products, saving the need to have drawings made up. 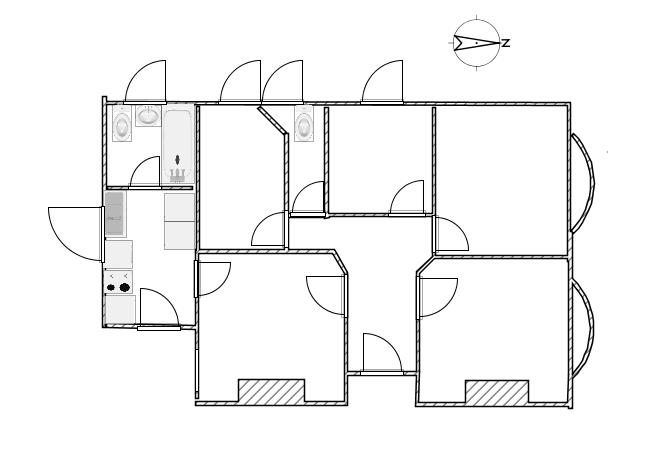 Another problem with having drawings done is that a builder will then need to follow those drawings – sounds obvious! But, if the builder prefers to build in a particular way, e.g some like to hand cut everything, some like to use steels, some like to use trusses, then they will have to build in a way that may not suit the team that they put together for the job. My builder is happy to use trusses, so it should all work out nicely! Anyway, I gave building control the 48 hour notice to start work (I did this a couple of weeks before start date to be safe!) and paid the £670 fee, and that is all. So, total drawings, planning and building control fees so far is. … £840. About £2000 less than what I spent the first time round! Although it is 11th April, it is still very wet out there. Today the foundation trenches were started. 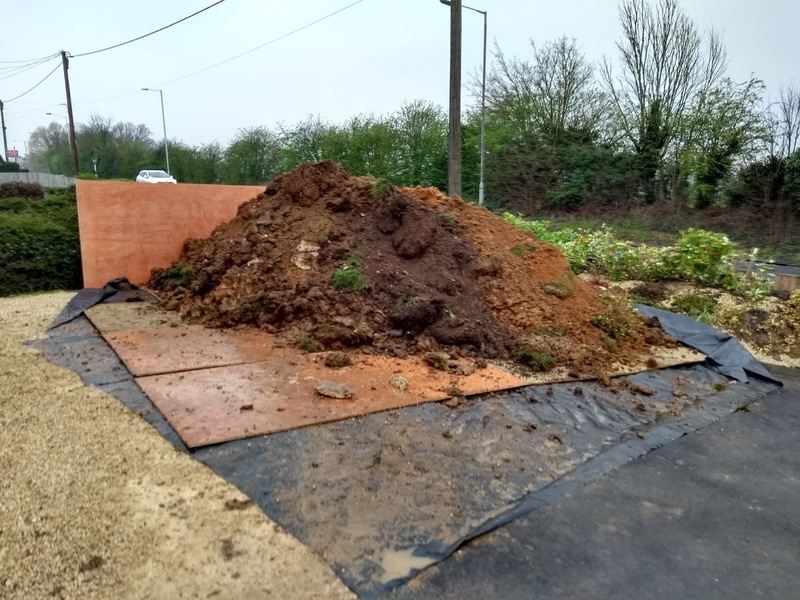 We already have a massive pile of earth out the front for the grab lorry, and 2/3 of the foundation trenches are dug out. 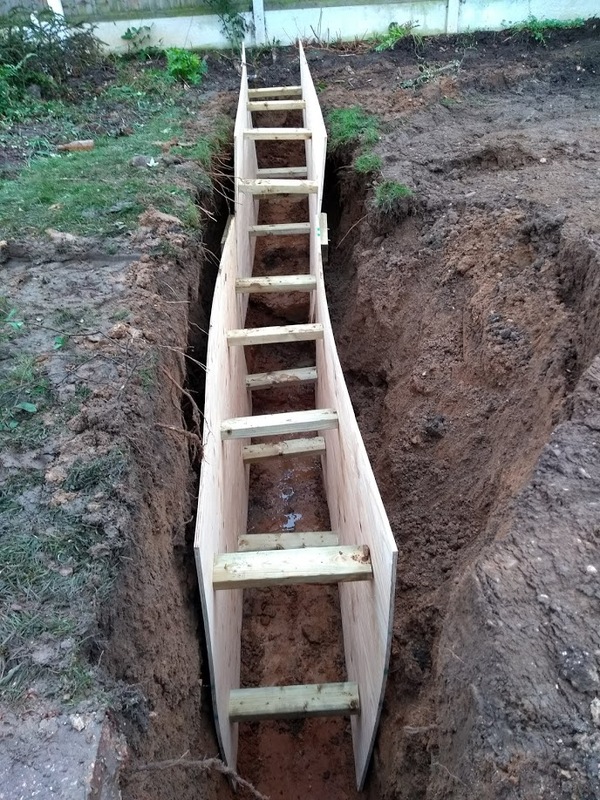 They had to go much deeper than planned as the ground was very boggy – the plan was to go 1.2m but it is about 1.8m deep. They had to put in supports so the soil doesn’t cave in. Also, all non-builders are strictly forbidden from entering the garden (bloggers excluded!). So, that is where we are so far. 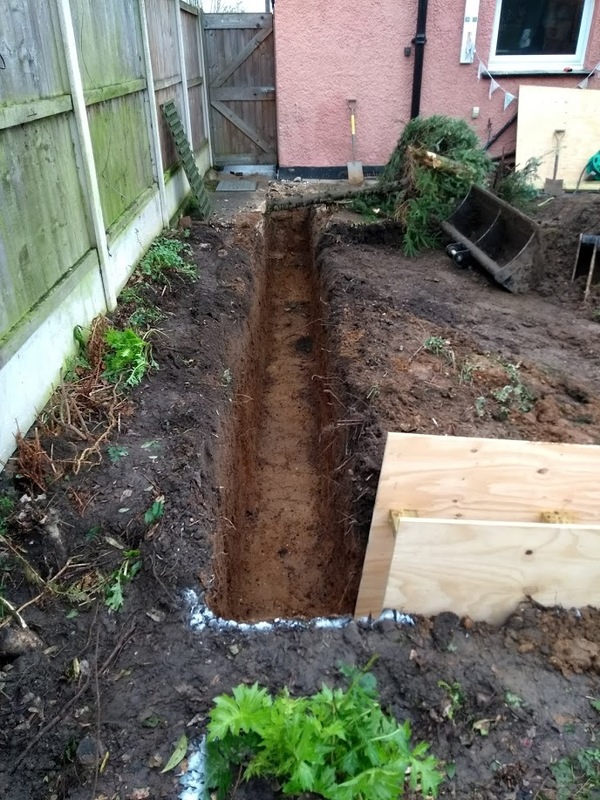 Tomorrow morning the building inspector comes, so I guess they will dig out the rest of the trench beforehand – the grab lorry was booked for 2pm but they could’t make it (said a mechanical failure), which is why the 3rd wall was left. All very exciting though! Published April 11th, 2018; edited April 12th, 2018.